Descendants fans were nothing short of excite when it was annoyed that Disney Channel legend China McClain would be joining the cast of the highly anticipated sequel to an already forever beloved DCOM. In Descendants 2 — which will air July 21at 8:00 p.m. ET/PT simultaneously on Disney Channel, ABC, Freeform, Disney XD and Lifetime — she takes on the role of Uma, the daughter of Ursula who has a bone to pick with Mal and Prince Ben, since she, along with her pirate gang, weren't selected to leave the Isle of the Lost and go to Auradon prep like other villain kids. 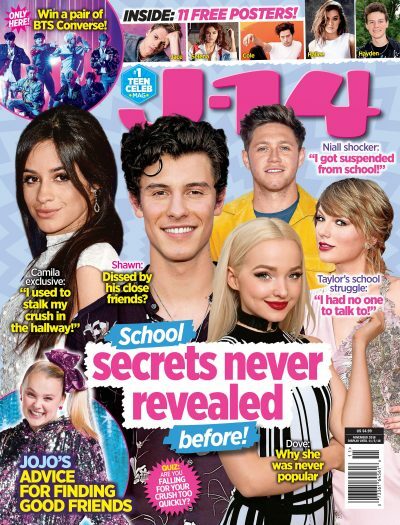 Dove Cameron, Sofia Carson, Cameron Boyce and Booboo Stewart play the core four, OG VK squad and China exclusively told us exactly what it was like joining this super tight-knit cast, along with other newcomers to the film Thomas Doherty and Dylan Playfair who play her on-screen besties Harry and Gil. Obviously everyone got along swimmingly, especially since she already knew Dove and Cameron prior to making this movie. Fun fact: China and Cameron already have worked together! "I’ve known Dove for a really long time and always wanted to work with her. So I was really excited about that. And Cameron I’ve actually worked with before on Grown Ups, I’ve known him since he was nine years old. So seeing him grow up, like I remember when he joined Jessie, he texted me and was like, 'China! I’m gonna be on Disney with you!' And I was like 'Oh my god!' We both still had Samsung phones. It was so great getting to work with Cameron again. And also the new people I was getting to know, like Booboo and Sofia, such a welcoming cast," China exclusively said to J-14. OK, so can we just a minute to process that? The fact that China and Cameron have a whole lot of history and are now getting to co-star together again in such a major project is truly remarkable. And the fact that China was one of the first people Cameron told when he booked the role of Luke Ross on Jessie? That is just all types of adorable. It's super sweet to know China already had such good buds on-set and she went on to tell us that the D2 cast really is such a family. She and all of the pirate squad actors and dancers got matching anchor tattoos together once filming wrapped, so she has a piece of her time as Uma with her forever, something that will last a lifetime, like her bonds with Thomas and Dylan, her right-hand men in the movie. "We all got very close during the film. Like this little tattoo I have here, they have them too. When you get a cast that you really connect to, it’s a special thing because to be honest, not all casts are like that, and sometimes we don’t get so lucky. So being able to work with them and then hang out with them after set every day was so, so great," China told us. "Thomas is awesome, he’s like crazy. He runs around the set with so much energy. So that always boosted my energy. And Dylan is just the sweetest person you’ll ever meet in your entire life." Tbh, everyone literally hung out all the time when they were done working for the day according to China, so yes, being on this set was just as fun as you're imagine. They even all had one spot they used to all just naturally congregate at when they had a free minute to grab something to eat and wind down for the day. "There was this restaurant right across the street from our hotel that we used to go to every night. We had a weird schedule, as you probably know, there were some scenes that Dove and the VKs were in, that I was over at the Isle of The Lost, while in Auradon. So either she would be filming that day or I would be filming that day, but afterwards, we all seemed to meet up and go to that restaurant and there were some really great times there," China said. We'll just be here wishing we were there.